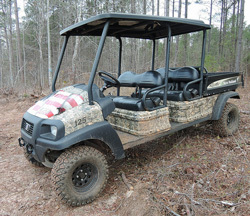 How would you customize a New Holland Rustler if you are going deer hunting? Or just hunting for anything (dove, turkey, rabbit)? What accessories would be good to add to our camp machine? As you can see this is a pretty basic model and we’re thinking about adding to it. Gun mounts seem like a logical choice. We’ve got magnetic blocks for the outside which are great for standing your gun and having it lean against the vehicle when stopped. Let us know what you would add or what you’ve found to be most useful for the woods. We’d love to hear from you.